Product Description MICROPROCESSOR-CONTROLLED MICROPLATE WASHER ELIMINATES TEDIOUS MANUAL PROCESSING. 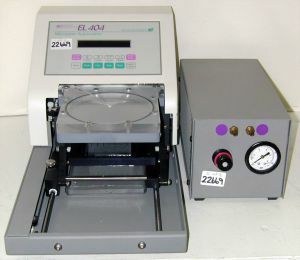 Accommodates all 96-well microplates; semi-automatic or automatic height positioning. Wash/aspirate 96 wells simultaneously in 8 sec. FLUID DISPENSING: Gravity-fed, transducer controlled fill volumes. (INCLUDES PRESSURIZED DELIVERY SYSTEM.) FILL VOLUMES: Set from 100 to 500 microlitres in 25 microlitre increments; set from 500 to 999 microlitres in 100 microlitres increments. WASH CYCLES: Select from 1 to 9. SOAK: 5-second increments from 0 to 600 seconds. PLATE SOAKING: Frequency - 5 to 15 cycles per second. Duration - 0 to 30 seconds. DISPENSING ACCURACY: Well-to-well variation - +/-5% at 350 microlitres. SUCTION EFFICIENCY: 6 microlitre maximum residual per well; adjustable. Additional compressor type pump is required and may be available at additional cost if needed. Bottles are not included.